The light has changed. It gets chilly in the morning. It feels like autumn, even though it’s extremely beautiful and sunny. The Christmas Shop in one of Dublin’s department stores has been opened (it’s crazy, isn’t it? You can still remember summer, you shouldn’t think of winter yet!). Autumn calls for autumnal treats. In our household there is love and hate situation over cinnamon. I love it, Tomek not so much. His whole family has a trauma from the childhood, where every autumn they were fed with apple pies containing far too much cinnamon. At first I started with replacing most of cinnamon with cardamon and ginger to get his approval, now he is able to eat apple pie with normal amount of cinnamon although he likes to grumble a bit. We were visiting friends over a weekend and I should plan it better, but I made one of recipes that’s already on the blog Tatra Mountains Apple Pie. On the bright side, it’s delicious. 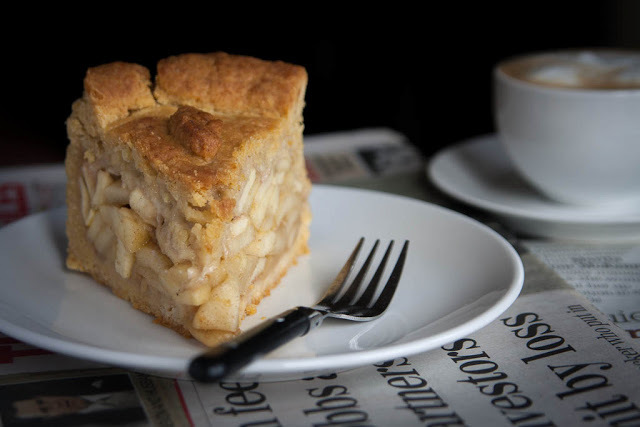 The pastry is super easy, there is a lot of apples and it’s a classic. So I thought I will use this occasion for talking about other apple pies that are on the blog so far. The marzipan apple pie, it’s like apple pie on steroids.It’s huge, it’s delicious and it’s quite special with the marzipan. The hazelnut crust apple pie is my friend’s favourite. The hazelnuts make it even more autumnal. I once dared to skip the top layer and instead of pie I made an apple tart. Sometimes it’s good to break rules. And if you want something really simple, go for apple muffins. Do you have your favourite apple pie recipe? Posted in Autumn, Cakes and tagged apples. Bookmark the permalink. Pozdrawiam serdecznie i milego weekendu zycze Magdo! No z tej marcepanowej jestem bardzo dumna, zarówno z wyglądu jak i ze zdjęć, ale do najlżejszych ona nie należy. Powodzenia w zdobywaniu jabłek i udanego weekendu Beo.